The story of Passover is pretty complex and rather long, which means you might lose your youngest kids in the retelling of it. Personally, I am a huge fan of The Prince of Egypt — an animated version of the Book of Exodus that’s perfect for children — and I can’t recommend it highly enough. But if you can’t spare 100 minutes to watch the film, or you need something in writing, I present to you Passover Junior. Much like MasterChef Junior, my version of the Passover story is delectable to younger palates — but without the profanity of Gordon Ramsay. Here goes. The story begins with a guy named Joseph. (Pro tip: If you want to get creative, turn on the soundtrack to Joseph and the Amazing Technicolor Dreamcoat and leave the room. Return in about an hour and a half.) Joseph did incredible things for the Egyptians — like saving them from an epic famine — and his family came and settled in Egypt. But after a lot of time passed, a pharaoh (a king of Egypt) rose to power who didn’t know Joseph and who didn’t think that any of the stuff he had done for the Egyptians was important. The Hebrews — we weren’t considered Jewish at this point, because we didn’t yet get the Torah from Mount Sinai — became the slaves of the Egyptians. What does it mean to be a slave? It means you work hard all the time, but you don’t get paid. Nor can you rest when you want, nor get to do what you want. Instead, Pharaoh, who was a really not nice person, was in charge of deciding what happened to the Hebrews. Pharaoh was terrible to our people. And when he heard someone predict that one day a baby boy would be born who would free the Hebrews from slavery, he freaked out and ordered all Hebrew baby boys to be killed! Like I said: terrible person. 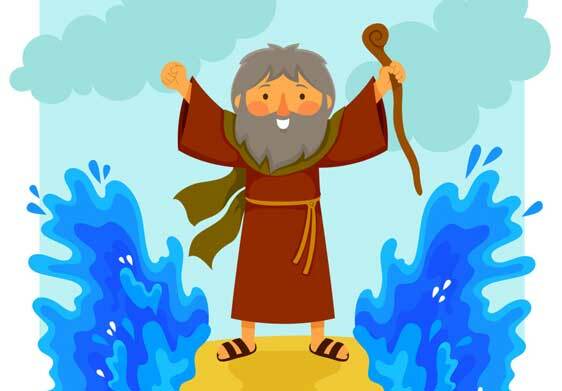 Moses grew up in Pharaoh’s family, not knowing he was a Hebrew. Still, he didn’t feel good about people making other people slaves. One day, he saw an Egyptian taskmaster beating a Hebrew slave. Moses thought it was wrong and tried to stop it, but he ended up killing the Egyptian. He knew he would be in big trouble, so he ran away from home, into the desert. So Moses went back to Egypt. He joined up with his brother Aaron, and together they told Pharaoh to free the Hebrew slaves. But Pharaoh said, “No way.” Moses warned Pharaoh that God would make terrible plagues — huge problems — that would hurt the Egyptians if Pharaoh didn’t let the Hebrews go. Pharaoh didn’t listen, and bad things happened to the Egyptians: the water in Egypt turned into blood; the land was covered with frogs, and then lice. There were beasts roaming everywhere, and then all the cows got sick and died. People got boils — weird bumps — all over their bodies. Hail fell from the sky. Bugs were everywhere. There was darkness; it seemed like night never ended. And then came the worst plague: the killing of the firstborns of Egypt, just like Pharaoh had tried to do to the firstborn Hebrews. Moses and the Hebrews knew that Pharaoh might change his mind, so they fled their homes, packing as much as they could as quickly as they could. They were in such a hurry, they didn’t even have time to wait for their bread to rise — remember, there were no grocery stores at this time! — and this is why we eat matzah during Passover. Sure enough, when the Hebrews got to the Red Sea, they turned around and saw Pharaoh and his army chasing them, trying to capture them. The Hebrews were really scared and worried. So God told Moses to stretch his arm out over the sea. Then a miracle happened: The sea split into two halves. The Hebrews walked through on dry land — but when the Egyptians tried to follow them, the path closed up again, drowning the army. The Hebrews were safe and free! They wandered in the desert for forty years as they made their way to Mount Sinai, picked up the Ten Commandments and a new relationship with God, and set off to Israel. Moses died before he got there, though. We tell this story every year at Passover, during a meal called the seder, because it is important to “bring home” the idea that we were once slaves and now we are free. We think about how horrible it is to be enslaved, and how wonderful and happy we are to be free. And what we do with that freedom is something we will spend the rest of our lives thinking about and talking about with each other.